This blog post was contributed by ESA’s Michael Khan, at ESOC’s Mission Analysis Office with inputs from Marc Toussaint at ESA Launchers directorate. It’s an excellent overview of the how the Proton rocket will loft ExoMars and Schiaparelli into orbit tomorrow and, specifically, what will happen during the approx. 11 hours between liftoff and separation. This post contains the best background information we have and keep in mind that there could be some minor inconsistencies between this text and anything published by Roscosmos or Khrunichev, which should be taken as authoritative. On 14 March 2016 at 9:31:42 UTC, a Proton M / Breeze M rocket will lift off from Baikonur Cosmodrome with the ExoMars 2016 spacecraft under its payload fairing. 10 hours and 45 minutes later, the rocket will release its payload and ExoMars will be on an Earth escape trajectory – the ExoMars 2016 mission will have started. But hey: ten hours and 45 minutes? Almost half a day? Why does it take so long this time? After all, with both the Mars Express and Venus Express missions the escape sequence was over within 90 minutes from liftoff. Indeed, this long escape sequence is linked to the choice of the Proton M / Breeze M launcher. To understand why it is like that, we should have a closer look at how the rocket operates during the launch sequence. Proton is one of the most successful heavy-lift boosters in the history of space flight, with its first launch taking place in 1965 during the heady days of the space race. The rocket has undergone many modifications since that time. It has more than 400 launches under its belt keeping a success rate of nearly 90%. The current version, Proton M, is to all intents and purposes a modern launch vehicle, albeit incorporating many of the original features of the 1960’s design. When it stands on the launch pad, it weights more than 700 tons, it is 58 meters tall, not strikingly elegant but certainly conveys an image of power and efficiency. The three-stage Proton version is used for launches into low Earth orbit such as the delivery flights for ISS elements, where it can deliver payloads of up to 22 tons. The first stage has an empty mass of 31 tons and can take 419 tons of propellant. A marvel of engineering efficiency, its six rocket engines deliver a combined thrust of 1000 tons, more than enough to lift the 700 ton rocket off the ground. The stage is jettisoned after two minutes and falls back to the Earth, some distance Northeast of Baikonur. The second stage, with a dry mass of 12 tons, carries 156 tons of propellant. It has four engines and runs for three and a half minutes before being jettisoned. The third stage has a dry mass of 4.2 tons, carries over 46 tons of propellant. It also contains the control system that guides the lower three stages during their ascent to orbit. For anything beyond low Earth orbit – such as for the ExoMars launch – the four stage Proton version is used. When the third stage is jettisoned, the stack will not have achieved orbital velocity yet. The spent third stage will keep flying, like a rock that has been thrown by a giant, until it finally enters the atmosphere and breaks up above the Pacific Ocean. The fourth stage, called the Breeze M, is almost a spacecraft on its own, allowing access to a variety of orbits including Geostationary Transfer or Geosynchronous Orbits, escape trajectories and all types of lower orbits. It uses its propulsion and an independent control system to manage the complex orbital and escape sequence that ensues. The fully fuelled Breeze-M weighs 22.3 tons, out of which almost 20 tons are propellant. On top of it sits the 4.3 ton ExoMars spacecraft, attached with an adapter to the stage. The main engine delivers a thrust of 2 tons, which is part of the reason why the escape sequence takes so long. Let’s go back to the complete launch sequence. The first stage, which burns for two minutes, takes the rocket to 43 km altitude, at a speed of 1.716 meters per second (m/s), more than 6.000 km/h. After the second stage burnout, it’s at 129 km altitude and 4.503 m/s, i.e. over 16.000 km/h. 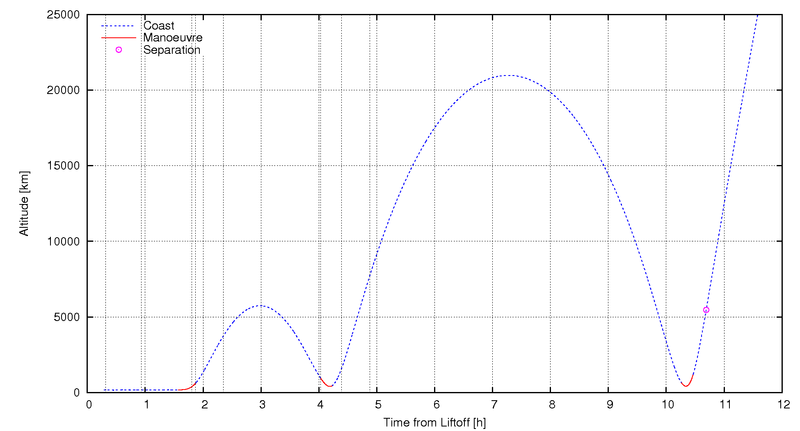 The third stage ups the ante to 153 km and 7.230 m/s, but still not quite at the orbital velocity. The Breeze M stage has to operate for around 6 minutes after the spent third stage has been jettisoned. At the cost of two tons of the propellant in the Breeze M tanks, insertion into a low circular Earth orbit is achieved. Let’s briefly take stock here. We are now just 17 minutes after liftoff, already three massive rocket stages are gone and more than 600 tons of rocket fuel have been used. We are still only 175 km above the surface of the Earth, on a low orbit that is just outside the Earth atmosphere, at an inclination of 51.5 deg. An additional boost of 4 km/s is still required for achieving Earth escape. All of it will have to come from the Breeze M – and that stage, which has just started, has already used up two tons of its propellant. Sound like “mission impossible”? Actually, it is anything but impossible. 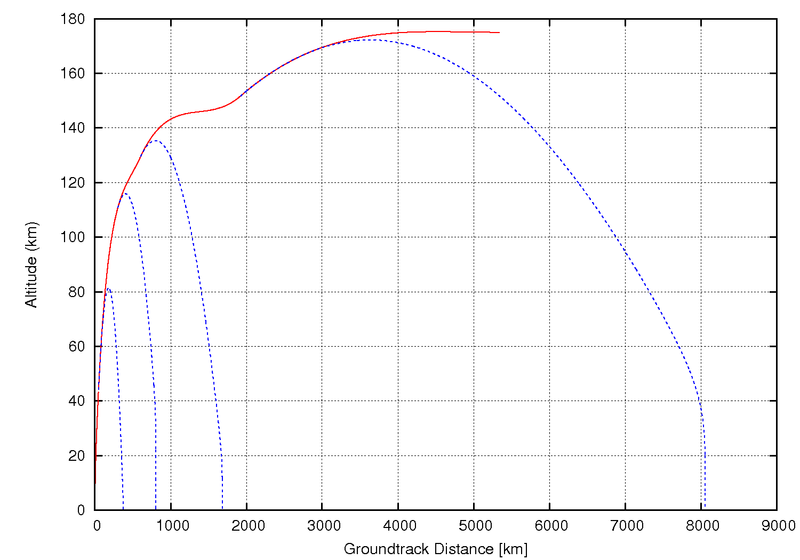 The remaining propellant is quite sufficient to speed up the stage and the attached ExoMars 2016 spacecraft by these 4 km/s. The Breeze M stage was not specifically designed to launch something like ExoMars, but satellites into many different Earth orbits. With either of those, though the velocity increment is large, not all of it is required at the same place of the orbit. Which means that there is no point in using a very powerful rocket engine on the Breeze-M stage. You can use one that is moderately powerful, much lighter and cheaper. This engine can be switched on, then off, then after some time back on, then off again, until the final orbit is reached. It can be restarted 8 times in flight. With an interplanetary spacecraft such as ExoMars, it would in fact be desirable to provide the entire added boost in one blast. If we could do that, the escape sequence would last only an hour or so. We mentioned Mars Express and Venus Express, which were launched with Soyuz-Fregat rockets. That rocket and stage work only for small payloads. It could never launch ExoMars to Mars. We need the Proton M / Breeze M for that. So the long and short of it is that although the Breeze M stage does carry sufficient propellant to inject ExoMars into its required Earth escape trajectory, its engine is not powerful enough to provide the required boost in one go. When there is a problem, engineers always find workarounds. That’s what they are educated for, that is what they have been doing since times immemorial. In this case, the workaround is very simple. If we can’t impart the boost in one go, then how about three smaller steps? 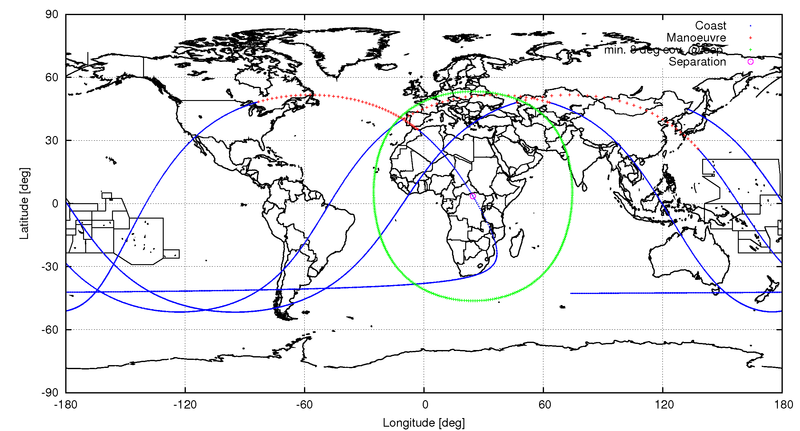 The starting boost will change the orbit quite a lot, from a circular orbit at 175 km altitude, to an eccentric orbit with its low point around 250 km, and the higher point, over 5.000 km. The stack (Breeze M with ExoMars) will have to wait until it completes a whole revolution, once around the Earth, on that orbit. That takes more than two hours. The next burn of the Breeze M engine will make the parking orbit even more eccentric. It will now top out at more than 21.000 km. The larger an orbit, the longer its takes to complete. In this case, it takes 6 hours. During that time, something ingenious takes place. The Russian engineers have designed the Breeze M stage with large toroidal tanks, shaped like a donut. These tanks contain the fuel used during the initial burn and subsequent manoeuvres of the escape sequence. When it is empty, it is designed to be jettisoned. This rids the Breeze M stage of 950 kilograms of useless dead mass. Then comes the final manoeuvre. By this time, the stack is much lighter, as it will have used much of its fuel and of course shed the empty tank. By virtue of the reduced weight, the engine has become much more efficient, so it can insert the stack into the escape hyperbola, in once. Some 15 minutes after end of the last manoeuvre,10 hours and 56 minutes after lift-off, the Breeze-M stage releases ExoMars. 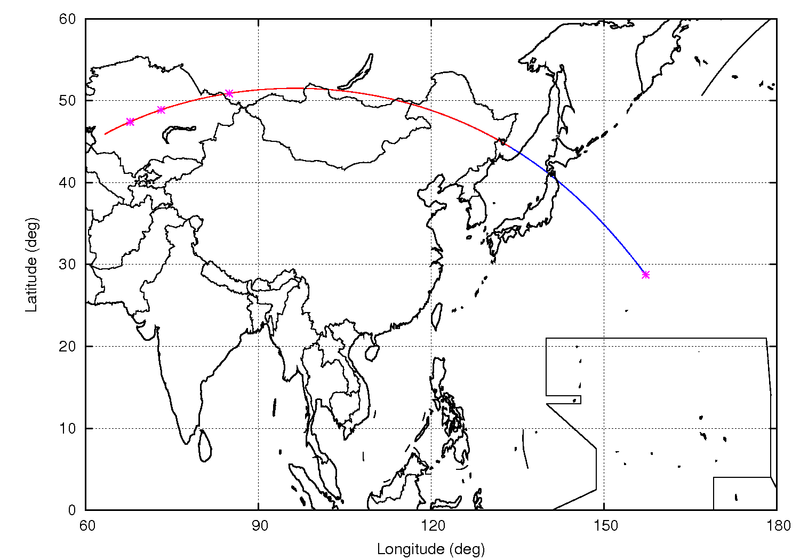 Proton M / Breeze M has completed its long escape sequence. This will not quite be the end of its mission. Some avoidance manoeuvres are performed so that the stage can neither get close to ExoMars again nor hit the planet Mars, 7 months later. After, it switches itself off, putting the batteries and tanks into a safe mode. In fact, Breeze M is also a Mars-bound spaceship, although it will never get as close to Mars as ExoMars. I’d imagine that is because the last time the “russian curse” on marttian probes took a victim, it was the (modified) Blok D’s fault that the probe got stuck in low orbit. There is a virtue in the simplicity and reliability of hypergolics. Blok-D is retired! Briz-M much more capable. Just out of curiosity; would it be possible after safe mode to boot Breeze M back on / make contact? There would be at least some guidance sensors on board to make an interesting aerobreaking experiment or if there are seismic sensors on mars bound land vehicles to make a penetration test. Are the batteries the bottleneck? Breeze M is an independent spacecraft which still has some mission goals for later in flight. The use safe mode is to preserve the batteries for contact when it gets closer to it’s objectives, but its Mars encounter won’t be anywhere near close enough to aerobrake or lithobrake. Also my Captcha thinks a canoe is a kayak. Thanks for this input! Strongly looking forward to the success of entire ExoMars programme!! While I think what I have interests in most is the 2018 rover, I think I understand the importance of TGO & Schiaparelli by many means. PLUS. If my understanding is correct, we may have a chance to see on the surface of another world another man-made vehicle descending from above, for the first time in human history (Right?!?!). Oppy can see meteor in the night sky, so if it will be at night time & Schiaparelli comes in close enough…. Schiaparelli has no need to land when the Sun is shining at it, right?? I think that you’re right. But it will be difficult to see the final part of landing. Also there a chance that Schiaparelli lands near Opportunity at Endeavour crater. Totally agree that to see the final part of landing is difficult, even if concentrating on that part only. But I suspect we really have a chance for earlier part of descending, as Schiaparelli will descend almost toward Oppy (in astronomical scale). But I also suspect that Oppy cannot see it at all if Schiaparelli will land at the most western part of the landing ellipse. More than 1000 kilometres away. And yes it will be very exciting if Schiaparelli lands near Oppy, but still it’s probably too far away for Oppy to visit. But still very exciting!! Let’s see what happens!! Many apologies. The larger diametre of Schiaparelli’s landing ellipse is about 100km, not one thousand km. I was not remembering correctly. 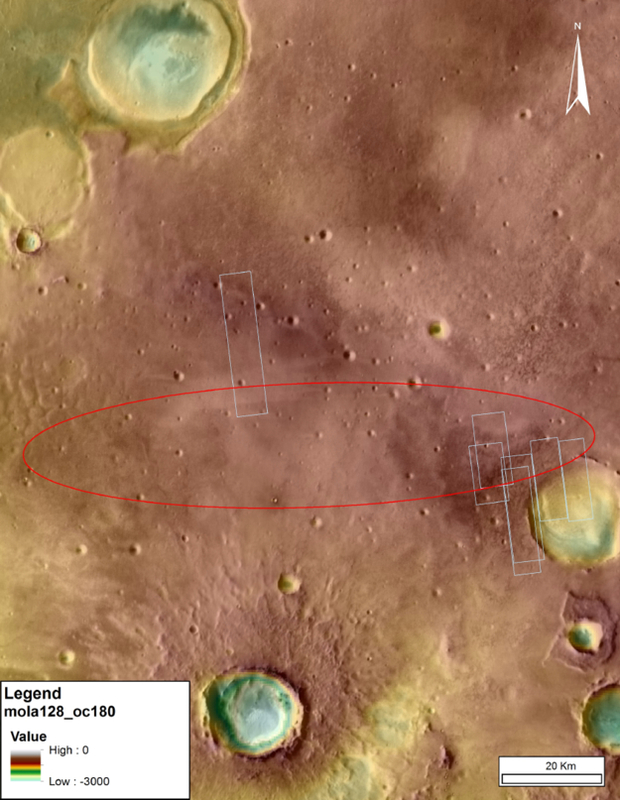 Do you know of any realtime “where is exomars” sites so we can track the path to mars? Thanks for the great article, ESA! It was great to read for once something that didn’t hold back on the orbital mechanics side of things. 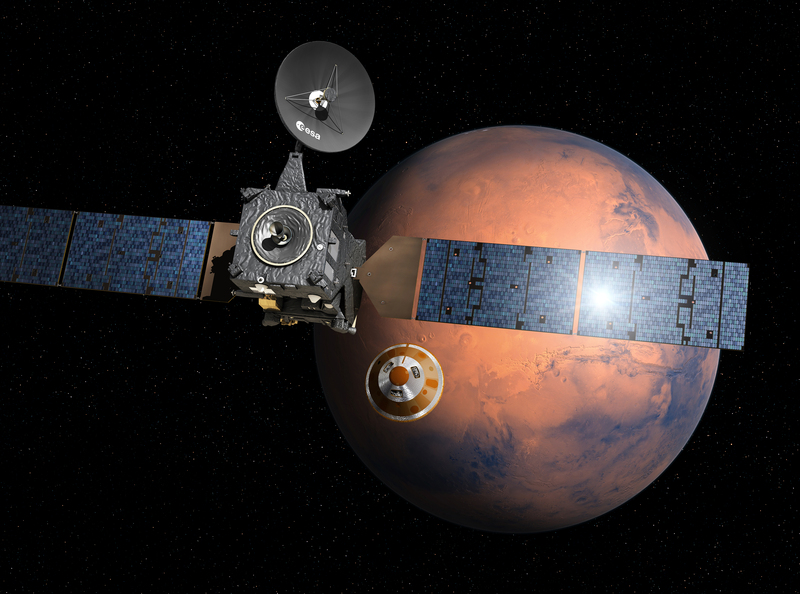 I’m very much looking forward to AoS this evening and ExoMars’ arrival at Mars later in the year.